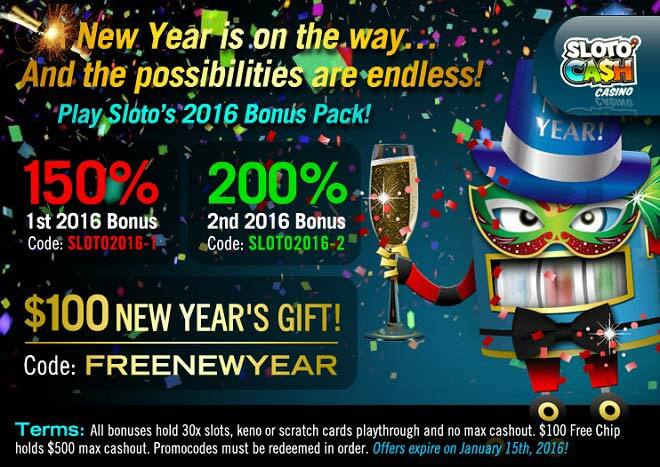 Celebrate the New Year with Sloto’s 2016 Bonus Pack! Significant changes come with a New Year and you can do just that when you become a significantly big instant winner this January when playing with our celebratory 2016 Bonus Pack! Meet your New Year winning resolutions right away this 2016 when you claim a 150% Match, followed by a festive 200% Bonus and topped with an extra special $100 New Year’s Gift! Your determination will take you winning places as soon as you ring in the New Year and claim our 2016 Bonus Pack!